What Next?, though expressed as a question, in the practice and approach of Riccardo Previdi becomes an “epoché,“ a suspension of judgment about the future, starting with the complexity of the present. In 1968 Mario Merz made a series of works containing the words “Che fare?” (“What is to be done?”). Leaving political readings aside, this work is first and foremost a question that the artist addressed both to himself and to his artistic practice at a particular time of the twentieth century. More than forty years later, Riccardo Previdi adopts Mario Merz’s approach to investigate today’s relationship with the present and the near future. The catalogue What Next? is characterized by questions, tests, temporal scores and abstract images that coalesce around three groups of works. that narrates the crossing of a border, may it be physical or mental. For many years now the Norwegian artist Øystein Aasan has investigated the ideas and visions of modernism. While the subjects of his collages, paintings and books may vary according to the different themes he researches, his exhibition formats are closely related to one of the fundamental developments of modern art: The success of the white cube and its putative neutrality. Associating himself as a modernist, he has systematically pursued the question of how exhibition design within this white cube affects the meaning and reception of the images and books on display. 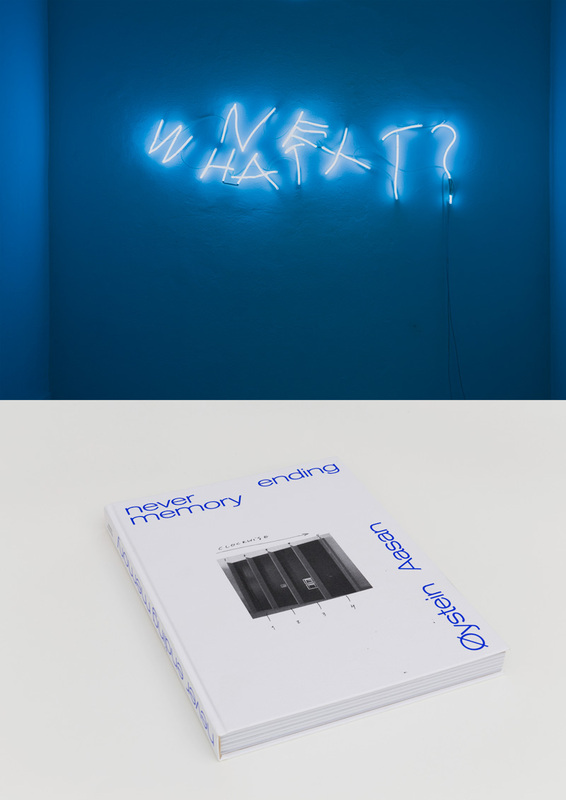 Never ending memory is the first publication in a series of three focusing on the overall praxis of Øystein Aasan. To be published are Never ending words, and Never ending works.